Colorkitten's Action Blog: book club bonanza! I actually ordered the kit after I read your initial post about it. I think I received it sometime in November or December. It is fabulous. I love that Target actually hired an illustrator with talent and creativity. My 3 year old also loved the kit and all of the stickers. Of course, I should have ordered two because she claimed everything as her own and now it's in the condition that you would expect it to be in after being played with by a 3 yo. 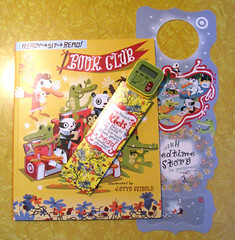 I have a few of the stickers from the kit on the cover of my ibook. Fun! That is sooo cool! I just signed Pumpkinbutt up for it,but I have a feeling we won't be getting all the cool stuff you did. It had an area on the site for printing out a doorhanger and a bookmark. Still very cute but you got the motherload. The website for it is really cute too, love the illustrations!